Chris Poskitt is participating in the Dagstuhl Seminar on Verification of Evolving Graph Structures. Our paper SmartWalker: Towards an Intelligent Robotic Walker for the Elderly won the Best Paper Award at the 11th International Conference on Intelligent Environments (IE'15). Our paper A Fully Verified Container Library won the Best Paper Award at the 20th International Symposium on Formal Methods (FM'15). Carlo A. Furia will give a tutorial on the Eiffel verification tools at TAP 2015 in L'Aquila, Italy. The second edition of our edX MOOC is starting soon! Julian Tschannen, Yu Pei, and Christian Estler successfully defended their PhD theses. Congratulations! The website for the LASER Summer School 2015 is now online. The topic for the 12th edition of this summer school is Concurrency: the next frontiers. The paper A Comparative Study of Programming Languages in Rosetta Code by Sebastian Nanz and Carlo A. Furia is discussed on Slashdot and elsewhere. Our paper Awareness and Merge Conflicts in Distributed Software Development won the Best Paper Award at the 9th International Conference on Global Software Engineering (ICGSE'14). Prof. Bertrand Meyer has been awarded an honorary doctorate by the University of York, UK, in recognition of his contributions to software engineering. Our group's research on automatic language translation gave rise to an ETH Spinoff company mtSystems. The company offers fully automatic, complete, and correct translation of C source code to Java source code, at a low cost and with low risk! Scott West successfully defended his PhD thesis Correctness and Execution of Concurrent Object-Oriented Programs. Congratulations! 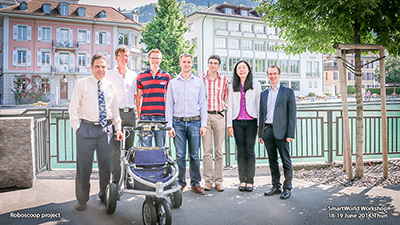 The Roboscoop team demonstrated their progress at the SmartWorld Workshop 2014 in Thun, Switzerland. Check out the video of the SmartWalker gesture control. Nadia Polikarpova successfully defended her PhD thesis Specified and Verified Reusable Components. Congratulations! 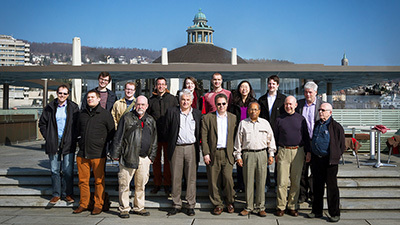 The first scientific advisory board meeting of our ERC Advanced Grant Concurrency Made Easy was held at ETH Zurich. The photo shows board members Manfred Broy, Maurice Herlihy, José Meseguer, Jayadev Misra, Dave Parnas, and Bill Roscoe with the CME team. Benjamin Morandi successfully defended his PhD thesis Prototyping a concurrency model. Congratulations! We hosted the Niklaus Wirth Birthday Symposium. It was hugely successful, with the many distinguished speakers contributing to the high quality of the event. The registration for LASER 2014 is now open. The topic will be Leading-Edge Software Engineering. On February 20 we will host a symposium in honour of Professor Niklaus Wirth's 80th birthday. The event is a full-fledged scientific conference with prestigious speakers. We invite you to register and join us in celebrating one of the founding fathers of computer science. Our paper Benchmarking Usability and Performance of Multicore Languages won the Best Paper Award at the 7th International Symposium on Empirical Software Engineering and Measurement (ESEM'13). Check out our MOOC! A project led by Marco Piccioni has resulted in an electronic version (Massive Open Online Course) of our popular course “Introduction to Programming”. Participants from anywhere in the world can take the course at their own pace, including exercises and quizzes. They can also compile and run their example programs on the Web, and test them against correct results, with no software installation required, thanks to Christian Estler’s Eiffel4Mooc framework at http://se.ethz.ch/mooc/programming. Our paper Collaborative Debugging won the Best Paper Award at the 8th International Conference on Global Software Engineering (ICGSE). We've launched a new website for our ERC Advanced Grant research project Concurrency Made Easy (CME). Find out about our team, our current research activities, the SCOOP concurrency model, and watch our new YouTube video at cme.ethz.ch. Try some of our research tools online. The Comcom website lets you run them directly in your browser... Read more. Our paper Collaborative Debugging has won the Best Paper Award at the 8th International Conference on Global Software Engineering (ICGSE). We've launched a new website for our ERC Advanced Grant research project, Concurrency Made Easy (CME). Find out about our team, our current research activities, the SCOOP concurrency model, and watch our new YouTube video at cme.ethz.ch. The paper Using Contracts to Guide the Search-Based Verification of Concurrent Programs by Chris Poskitt and Simon Poulding has been accepted for publication at SSBSE 2013. The paper Examining the Expert Gap in Parallel Programming by Sebastian Nanz, Scott West, and Kaue Soares da Silveira has been accepted for publication at Euro-Par 2013. Try some of our research tools online. The Comcom website lets you run them directly in your browser. Comcom currently features the tools AutoProof, Boogaloo, Javanni and QFIS. The paper Collaborative Debugging by H.-Christian Estler, Martin Nordio, Carlo A. Furia, and Bertrand Meyer has been accepted for publication at ICGSE 2013. The paper Concurrent Object-Oriented Development with Behavioral Design Patterns by Benjamin Morandi, Scott West, Sebastian Nanz, and Hassan Gomaa has been accepted for publication at ECSA 2013. The paper Program Checking With Less Hassle by Julian Tschannen, Carlo A. Furia, Martin Nordio, and Bertrand Meyer has been accepted for publication at VSTTE 2013. The paper Prototyping a Concurrency Model by Benjamin Morandi, Mischael Schill, Sebastian Nanz, and Bertrand Meyer has been accepted for publication at ACSD 2013. The Roboscoop team has successfully demonstrated their progress at the SmartWorld workshop in Spiez, Switzerland. A video of the SmartWalker in action is available online. The paper "Unifying Configuration Management with Merge Conflict Detection and Awareness Systems" by H.-Christian Estler, Martin Nordio, Carlo A. Furia and Bertrand Meyer has been accepted for publication at ASWEC 2013. The paper "What Good Are Strong Specifications?" written by Nadia Polikarpova, Carlo A. Furia, Yu Pei, Yi Wei, and Bertrand Meyer has been accepted for publication at ICSE 2013. The paper "The Search for the Laws of Automatic Testing" written by Carlo A. Furia, Bertrand Meyer, Manuel Oriol, Andrey Tikhomirov, and Yi Wei has been accepted for publication at the Software Verificationa and Testing track of ACM SAC 2013. The book "Modeling time in computing" written by Carlo A. Furia (with D. Mandrioli, A. Morzenti, and M. Rossi) has been published by Springer and is available online. The paper Who is Accountable for Asynchronous Exceptions?, written by Benjamin Morandi, Sebastian Nanz, and Bertrand Meyer, has been accepted for publication at the 19th Asia-Pacific Software Engineering Conference (APSEC'12). The paper Design of an Empirical Study for Comparing the Usability of Concurrent Programming Language, written by Sebastian Nanz, Faraz Torshizi, Michela Pedroni, and Bertrand Meyer, has been accepted for publication in the journal Information and Software Technology. Our paper Agile vs. Structured Distributed Software Development: A Case Study has won the Best Paper Award at the 7th International Conference on Global Software Engineering (ICGSE). The paper C to O-O: beyond the easy stuff, written by Marco Trudel, Carlo A. Furia, Martin Nordio, and Bertrand Meyer with Manuel Oriol, and the tool paper Automatic C to O-O translation with C2Eiffel, written by Marco Trudel, Carlo A. Furia, and Martin Nordio, have been accepted for publication at the 19th Working Conference on Reverse Engineering. The paper Demonic Testing of Concurrent Programs, written by Scott West, Sebastian Nanz, and Bertrand Meyer, has been accepted for publication at the 14th International Conference on Formal Engineering Methods. The paper A Verifier for Functional Properties of Sequence-Manipulating Programs, written by Carlo A. Furia, has been accepted for publication at the 10th International Symposium on Automated Technology for Verification and Analysis. The paper Performance Analysis of SCOOP Programs, written by Benjamin Morandi, Sebastian Nanz, and Bertrand Meyer, has been accepted for publication in the Journal of Systems & Software. The paper Automata-Based Verification of Linear Temporal Logic Models with Bounded Variability, written by Carlo A. Furia with P. Spoletini, has been accepted for publication at the 19th International Symposium on Temporal Representation and Reasoning. Our paper Agile vs. Structured Distributed Software Development: A Case Study., authored by H.-Christian Estler, Martin Nordio, Carlo A. Furia, Bertrand Meyer and Johannes Schneider has been accepted for publication at the 7th International Conference on Global Software Engineering (ICGSE). The Chair of Software Engineering welcomes two new PhD student members: Andrey Rusakov and Mischael Schill. The paper Can Asynchronous Exceptions Expire?, written by Benjamin Morandi, Sebastian Nanz, and Bertrand Meyer, has been accepted for publication at the 5th International Workshop on Exception Handling (WEH'12) @ ICSE 2012. Bertrand Meyer and the Chair of Software Engineering have received an Advanced Investigator Grant (AIG) from the European Research Council (ERC) for the "Concurrency Made Easy" project. The AIG program of the ERC is the most prestigious funding mechanism of the European Union, with a success rate of about 12% out of a set of applicants (well-established researchers) already strictly self-selected by their institutions. Our project is the first one awarded to ETH in computer science since the AIG program was started in 2008. The grant is for approximately 2.5 million euros (3 million CHF) over a period of five years, starting April 2012. The goal of the project, Concurrency Made Easy, is to contribute a breakthrough advance to software engineering by making concurrent programming as straightforward and reliable as other forms of programming. The stakes are huge, since with the end of Moore's Law as we knew it the only path to further performance improvements is through the use of concurrent architectures, but the commonly used techniques, such as multithreading mechanisms in common programming languages, remain at an unduly low level of abstraction, making them hard to use and leading to unreliable programs. The project description is available here. We will shortly publish position announcements for postdocs, PhD students and a research engineer.